Where can I find a company’s date of incorporation or year founded? 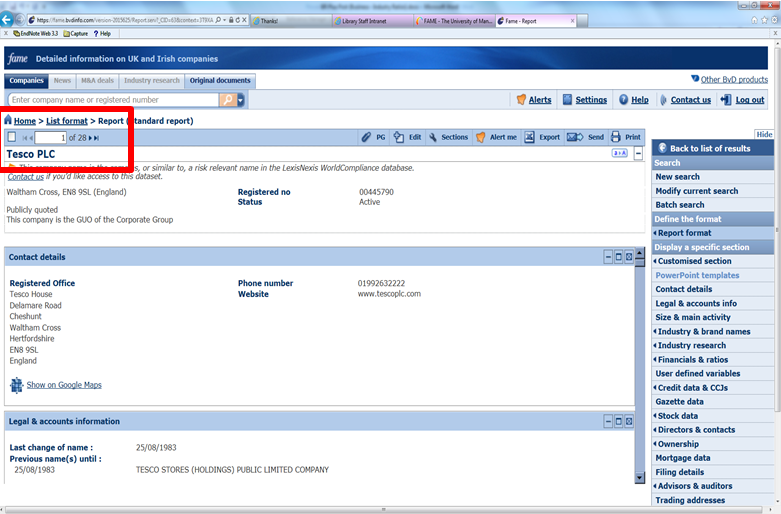 In Fame, the date of incorporation in the Company report, under the Legal & accounts information section. The buying or selling of a security by someone who has access to material, nonpublic information about the security. Search for the company you want. 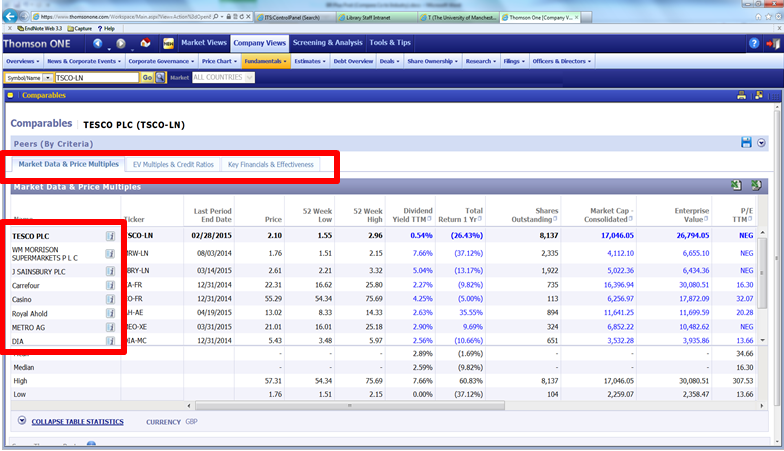 Click on the Company Analysis > Ownership folder, and select Insider Holdings or Insider Transactions report. Click “Click here for full history” for historic holdings (older than 24 months). On the long menu down the left, choose Investors > Public Ownership, then the Insider Trading tab. Only the last 12 months are available. 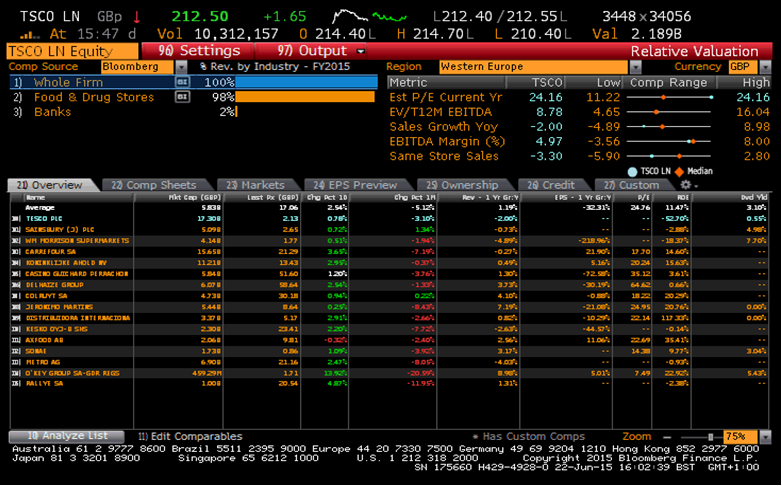 Try Bloomberg function PHDC for a specific company (e.g. VOD LN <F8> PHDC <GO>) and select Insiders, sorted by size. 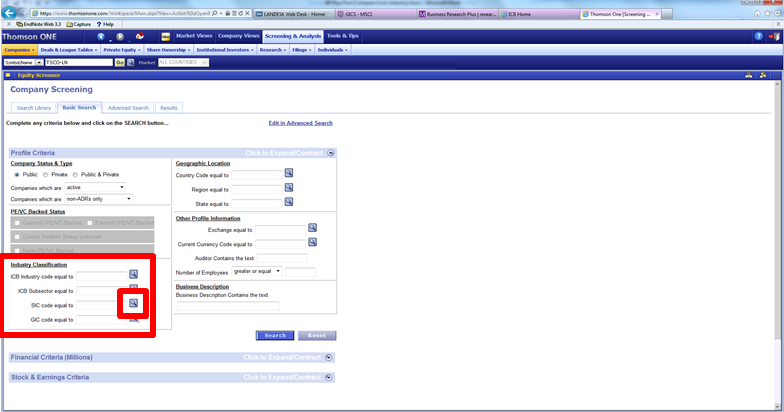 You can also look up the biographies of executies/directors (BIO) and then choose Reported Holdings. For stocks that have experienced the most purchases and sales by insiders, type: INSD and hit Go. 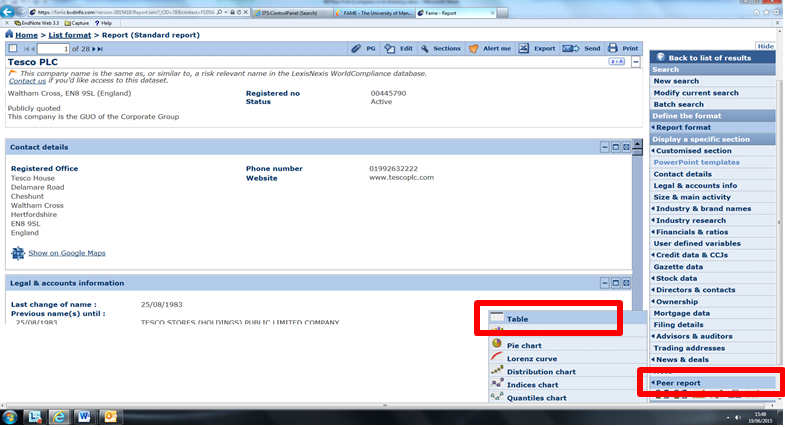 Use the fields at the top of the screen to select country, time period, type of transaction. Click on a stock to display a graph of its historical prices with date of insider transactions. For more info, type: insider and hit the green Help key <F1>. 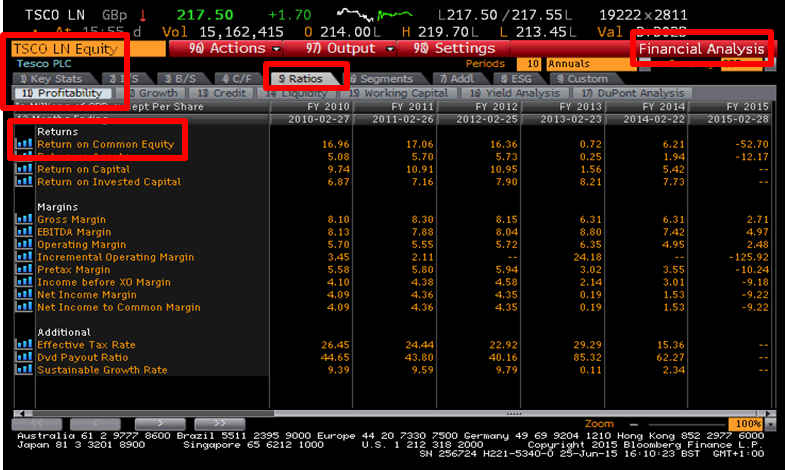 Choose Thomson Reuters database, and then Insiders Data. Search by company ticker. Check the variables you want in your report. 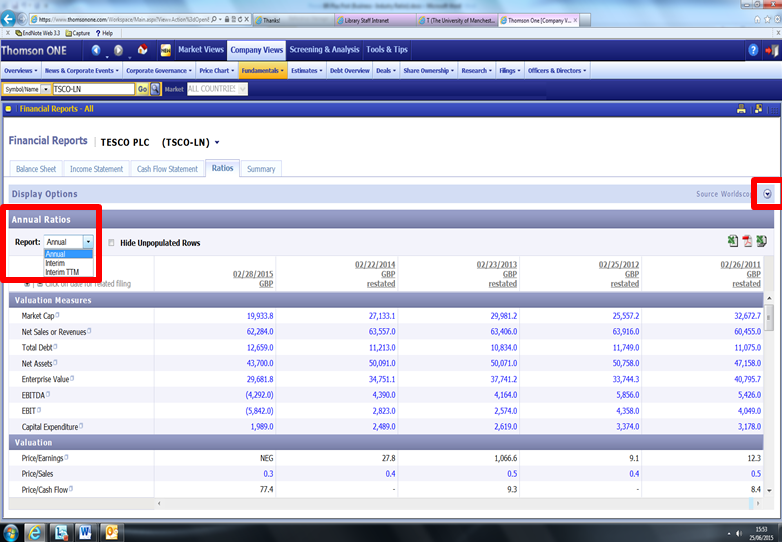 Insider filings with the U.S. SEC are available through Edgar. Enter your company name or ticker symbol or CIK and Include Ownership forms. For current annual reports, a company’s website is often the quickest and easiest option. PI Navigator: Include Annuals / 10K / 20-F (Company Reports and Accounts) in search criteria or select Perfect Filings tab and include Document Type UK Annual Reports or similar depending on your search. Try EDGAR for reports filed with US SEC. You can change the date and the time interval. Note: limited historical intraday data is available approx 900 trading days for GIP and 50 trading days for GIT. For US stocks, go to Wharton Research Data Services (WRDS) TAQ (New York Stock Exchange Trade and Quote, or NYSE TAQ. 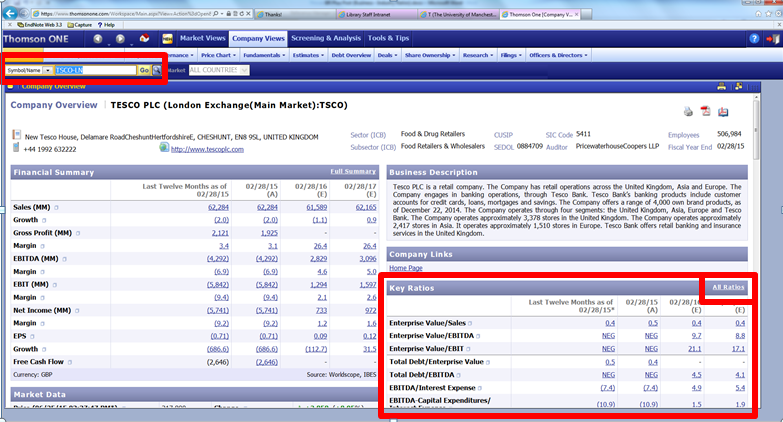 TICKDATA provides a commercial service offering intraday data from the UK and other exchanges. Finally, Thomson Reuters Tick History database offers global intra-day Time and Sales, Time and Quotes and Market Depth content from the 1st January 1996 for an extensive range of Equities, including their derivatives. Access to this resource is limited; please contact us. In seeking out ratios for companies I would be reluctant to use free web-based services. The University of Manchester Library pays subscriptions to allow current students and staff to use numerous specialised financial databases. These are trusted sources, used for academic research and by commercial businesses. The following databases are easy to use for obtaining ratio data. 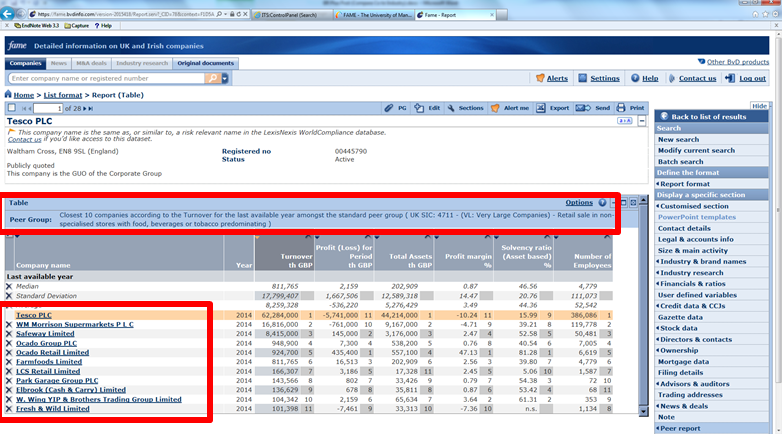 Once a company has been searched for (see search box highlighted) and overview screen displayed, Key Ratios are shown. There is also a link for ‘All Ratios’. It is preferable to select ‘Annual’ as Report Type – this selection option is revealed from the icon on the right of the screen. Ratios are grouped into a number of categories: Valuation Measures, Valuation, Enterprise Value, Credit Statistics, Liquidity Leverage, Profitability, Efficiency, Management Effectiveness, Dividend, Growth Rates and Stock Performance. Search for a company and display the Report. It is then a simple matter of scrolling down to the section on Ratios. These are grouped into a number of categories: Profitability, Operational, Structure and Per Employee. On the command line (top left of the screen) type the company identifier (quote/ticker symbol: TSCO LN = Tesco PLC on the London stock exchange), category of information via yellow market sector key (F8/Equity – company related) and function code (FA for Financial Analysis), followed by the green Enter/GO key. Click on the ‘ratios’ tab. 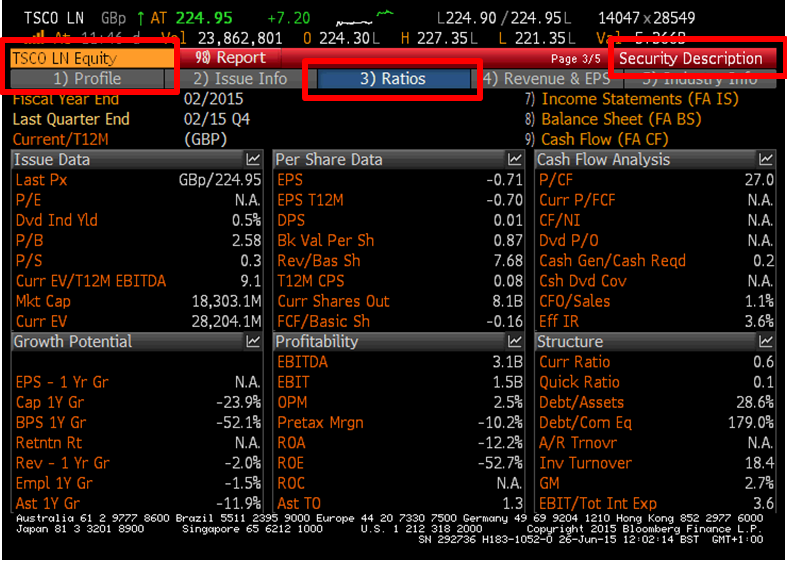 TSCO LN F8/Equity FA ‘Ratios’ is further divided (e.g. Profitability displayed). Hover over a ratio and right click, select ‘Definition’ for further detail (e.g. ‘Return on Common Equity’). A different grouping of Ratios can be obtained from the Security Description [DES] function and the ‘Ratios’ tab. It is also possible to obtain ratio details from Datastream, but is a little more involved than the databases noted above. A basic breakdown of a few ratios are displayed from the ‘Overview of Company Performance’ analysis option for the Equities (Company) Data Category. More specific searches are possible for multiple Series (companies) and Datatypes (various ratios, for example) from the Excel Add-In version of Datastream. For students at the University of Manchester we run regular Datastream training courses and other support material is available in the Database Suite. Comparing a company to its industry is not always straightforward. There are many classification systems to group similar companies together. There are UK/US SIC [Standard Industry Classification] codes and an additional, separate one for North America [NAIC – North American Industry Classification] – just to muddy the waters! Oh, and there is another, International industry system: Global Industry Classification [GIC] developed by MSCI (Morgan Stanley Capital International and Standard & Poor’s). 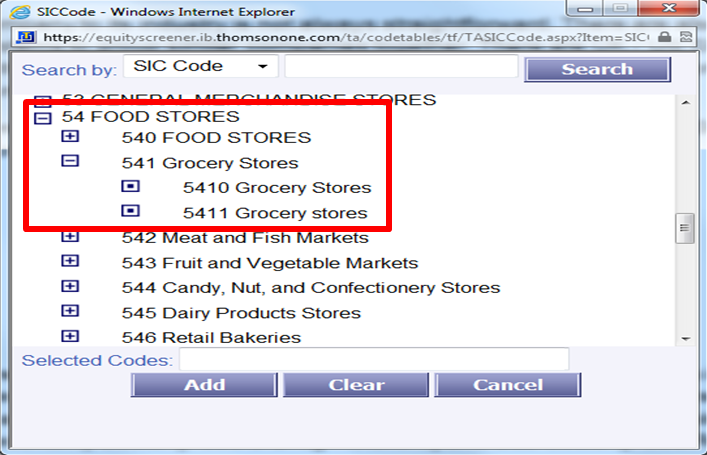 Thomson ONE database shows a SIC of 5411 [Food Stores – Grocery Stores] for Tesco PLC, which is the US version (not specified) and also by economy Sector [Food & Drug Retailers] and Sub-sector [Food Retailers & Wholesalers] – this is categorised according to the ICB (Industry Classification Benchmark). Where a company competes against a select/limited group of competitors (which may be considered a Market – such as the UK Grocery Market), many databases provide quick quantitative comparisons. For example, in the Fame database (UK & Ireland public/private companies), Tesco PLC has the SIC code 4711 [UK SIC (2007), Very Large Companies – retail sales in non-specialised stores with food, beverages or tobacco predominating]. 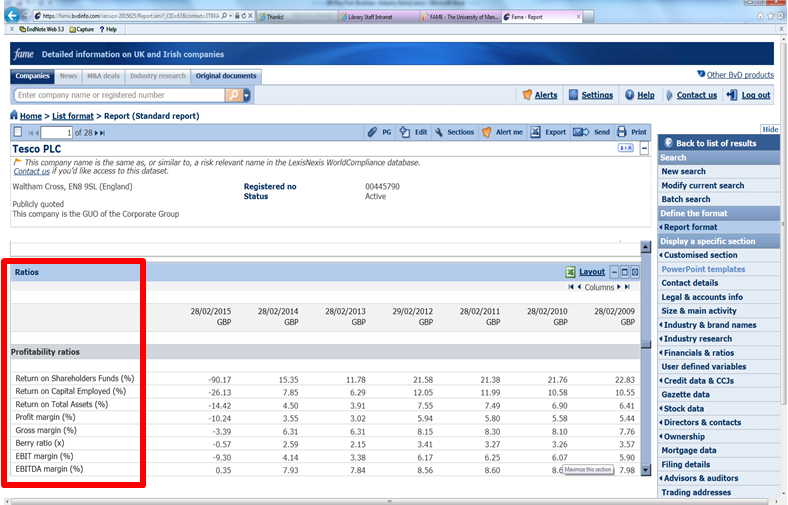 Selecting the ‘Peer Report’ (Table) function allows comparison with other similar companies. This describes the comparison as: ‘Closest 10 companies according to Turnover, for the last available year amongst the standard peer group (UK SIC 4711, Very Large Companies) – retail sales in non-specialised stores with food, beverages or tobacco predominating’. Strangely, this list doesn’t include Sainsbury or Asda, which are clearly competitors – so caution is advised when using such functions. This gives a list of companies in the same Industry – but again a note of caution, as this list doesn’t include Lidl or Aldi, which are competitors. Note also the tabs for additional data. 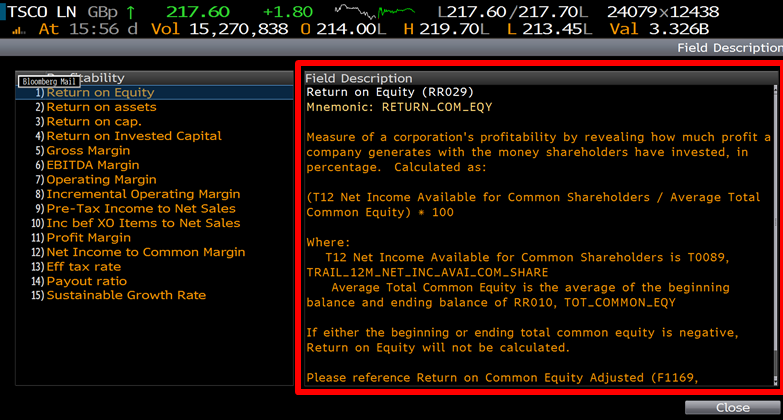 Bloomberg has the RV (Relative Valuation) function which, according to the help screen definition allows you to perform a relative valuation analysis on a single company (e.g. 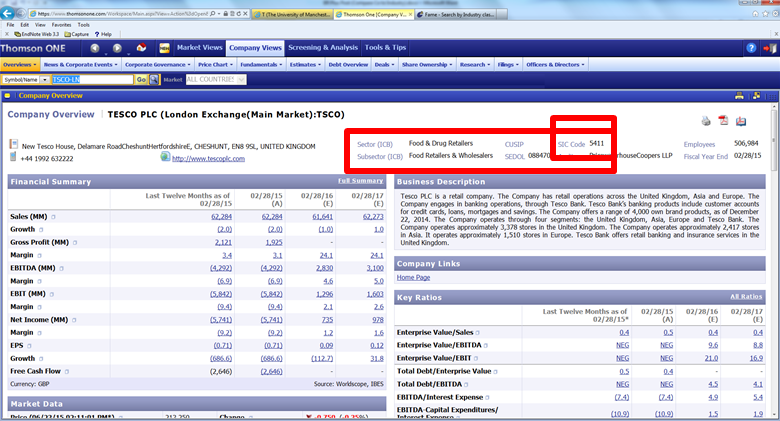 Tesco PLC) by comparing (benchmarking) against comparable companies in the same Market/Industry. Passport, Frost & Sullivan, IHS Connect and Freedonia. ‘All’ seems to shows a familiar market breakdown – Tesco PLC 1st, but recently has been losing market share to discounters, Aldi and Lidl, which has been accentuated since this research was conducted (December 2013). The way that research is framed is also important in considering whether you are comparing on a like-with-like basis, or close to this. Fragmentation in the market research conducted (for example, market share at physical stores only or physical stores and Internet sales combined, when producing market share values for different companies) makes this more difficult – hence the benefit of locating a report which closely matches the area of research you are interested in. In this Market Research report, Lidl and Aldi are included in the comparison, where they weren’t in the above comparisons. KeyNote (Reports – UK coverage). Thomson Research (Reports [Company/Industry] – International coverage) – this is particularly good for in-depth reports, at the Company and Industry level. These reports can include SWOT analysis and other factors influencing a company’s current and future performance. There is often a mismatch between what a student requires and what is available in terms of resources (business databases). In these cases, providing a solution is not always easy or apparent. In one example, where a student asked for data on the ‘pump, bearings and gears’ industry – how companies were performing in relation to the market as a whole in the UK. I had to explain that this area didn’t represent an ‘Industry’ and therefore there would be little if any market research available. It also didn’t represent a ‘Sector’ or ‘Sub-Sector’ of the economy. This meant that there would be limited content from database sources, which tend to organise data by individual companies, industry or sector of the economy. In this case a compromise (in terms of the analysis conducted) had to be arrived at in consultation with the student. In summary, getting the best approach boils down to what data is available from database sources and the possibility of a student having to modify the terms of their research. This highlights a key consideration, which is often ignored – how easy is it to obtain the data that I need for my research? See additional post on this area (Research Feasibility, dated 10th February 2015, also in this Business Research Plus blog.). 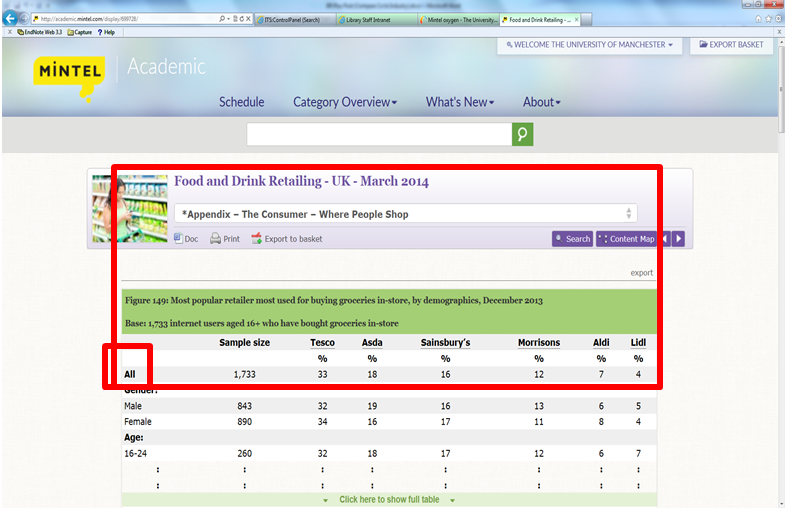 The databases noted above are available to use by current students and staff of the University of Manchester. NAIC (North American Industry Classification). (Used in Thomson ONE database). Industry Classification Benchmark [ICB]. (Used in Thomson ONE database). Global Industry Classification [GIC] (MSCI: Morgan Stanley Capital International / Standard & Poor’s). (Used in Thomson ONE database). UK SIC. (Used in Fame database). US SIC. (Used in Thomson ONE database).